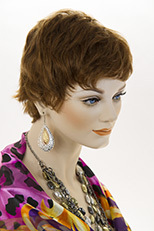 Feminine wet look spiral curls, which fall past the shoulder make a dramatic statement! The hair falls to the mid back. See item details for available colors. Additional colors may be ordered. Please allow a week for delivery. Classic and chic! Short, mid length, chin length straight bob with bangs. Featuring a natural looking skin middle part. See item details for available colors. Feminine and dramatic! 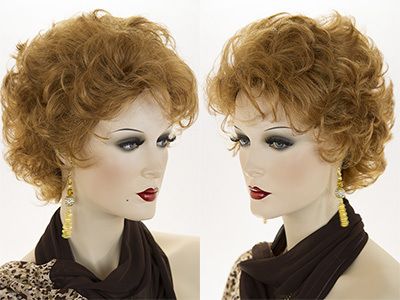 Long, curly, ringlets frame your face in a layered gypsy style wig. The hair length is 16 inches. See item details for available colors. 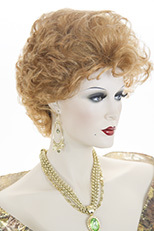 Stunning short, feminine, glamorous, wavy, curly Harlow style wig, which tapers at the nape. Featuring new exclusive colors. See item details for available colors. 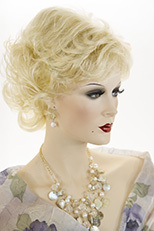 Classic, short ,feminine, layered, wavy, curly style wig. Featuring, a lightweight classic cap. The hair is approximately 3 inches in length throughout Available in natural looking shades of blonde and brunette and red. Please see item details for color selection. 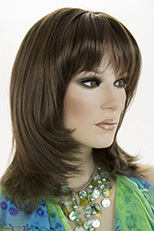 Make a dramatic entrance, with this striking long wavy, layered wig with long bangs. The bangs are 5 1/2 by 7 inches long. The length of hair is 30 inches. See item details for available colors. Youthful wet look modern layered razor style shag with bangs, which are 6.5 inches in length. The overall hair length is 7 inches all around. See item details for available colors. Fun party wig! Short razor cut punky style rocker hair! See item details for available colors. Glamorous! 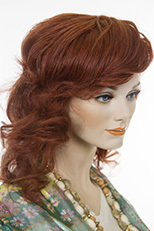 Long curly wavy gypsy shag style wig. The hair is layered throughout and falls to 24 inches in length. See item details for available colors.